Last week our Denali team (Yes We Xan!) tackled the Eklutna Traverse. This outing was meant to be our final shakedown trip before we leave on May 10th. Being our final shakedown meant we hauled all of our Denali equipment (110+ lbs. per person), skipped the 5 huts scattered across the traverse, and brought a ridiculous amount of food/fuel. Although the traverse can be done in a handful of days, we gave ourselves 8 days to complete the trip. 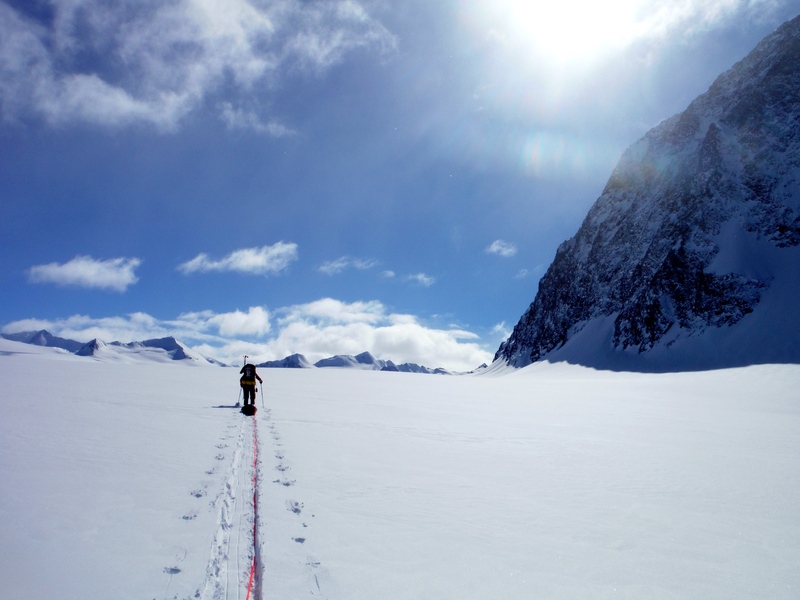 The longer timeframe was because none of us had ever attempted the heavily glaciated route from Eklutna Lake to Girdwood, so we planned to move slow with our heavy loads and desire to ski near by peaks. The first day of our proposed trip posed the biggest crux. Getting our packs and sleds full of equipment the 11 miles to the Serenity Falls hut. This would have been no problem if we had snow for our sleds or less equipment so that we could have biked. Instead, we swallowed our pride and opted to get a 4-wheeler ride back to the hut. Once we were dropped off (which took 2 trips to get all the people/equipment in), we ate a quick meal and headed to bed. 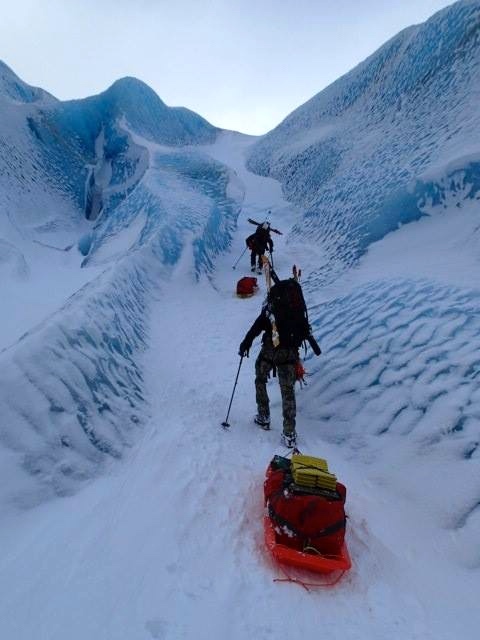 In the morning we talked about the best way to transport our equipment the 2 additional miles to the toe of the glacier. 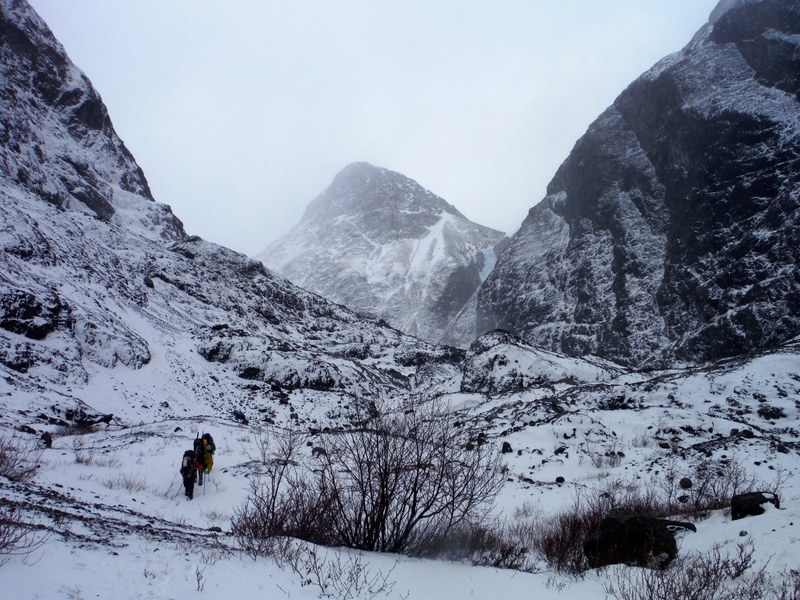 Without snow to pull our sleds on, we decided to double carry to the glacier. As water warmed for breakfast, we witnessed a large avalanche off of the west side of our proposed route to the toe of the glacier.With weather moving in and out, we set off with our first load at 9:30 am. We pushed up the 2 miles and 2,500’ to the toe of the glacier by 12:30pm. As we prepared to stash our first carry, I dropped my pack and searched for a way up the ice and onto the glacier. We had been told that, depending on the year, getting onto the glacier could be one of the most challenging parts of the trip. Luckily, I found a ramp of snow tucked between two ice walls that provided a very manageable way onto the glacier. With a way up the glacier established, we returned to grab our second carry. By 5pm we had all of our equipment, transitioned to crampons, and single hauled onto glacier. 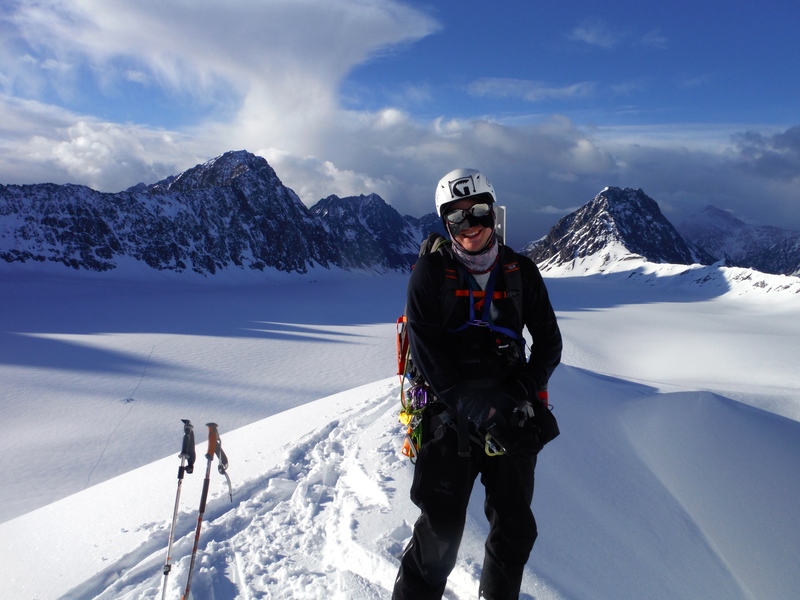 Once on the glacier, we roped up and began route finding through crevasse fields till 8pm. As we lost the daylight, we probed and flagged a campsite for the night. The next day we started slow, but began to move faster as the skies cleared. 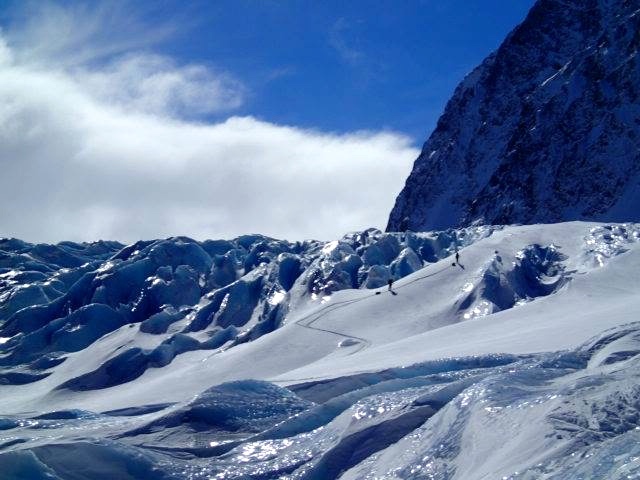 Once roped, we picked our way through the blue ice and crevasses that scattered the glacier. 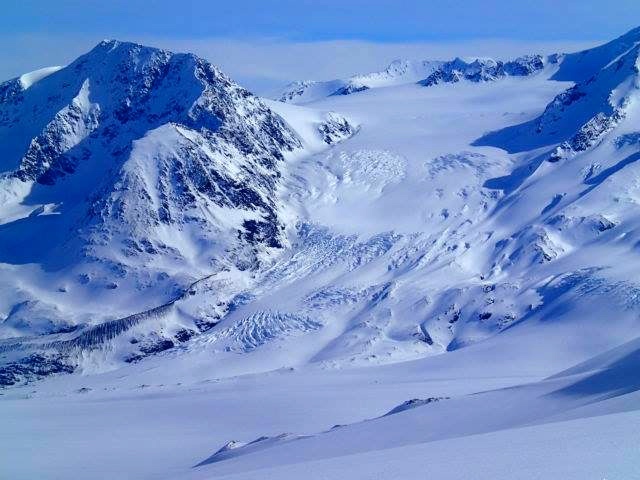 As we gained elevation the blue ice began to disappear and was replaced with the huge snow expanse that is the main body of the Eklutna Glacier. For the next few hours we worked our way up the glacier with Peril Peak (one of the 7k+ peaks in the Chugach) towering above us. Peril’s massive ridge made the time we spent under it feel endless. Eventual we left Peril Peak behind us and made our way to Whiteout Pass. Not wanting to repeat our late camp setup from the day before, we decided to start making camp by 6pm. As we prepped our campsite, I stared at Antarctica Peak behind us. Two of my team members, Nick and Jake, began to notice and offered to set up camp so that Pete and I could go ski. Excited to finally be able to ski, I offered to break trail out of camp and set the skin track up the peak. We ditched our rope as we made our way off the glacier and up the mountain. Like most of the Chugach, it ended up being much steeper then it looked from camp. Soon we made it to the ridgeline below the summit, but we were unable to make a summit push due to severe wind loading. Conscious of the fading light, we quickly transitioned and enjoyed our first ski run of the trip. It was amazing! Remote, steep, and filled with super hero snow! The only downside was that it was over so quickly. After only a handful of turns, we raced back to camp, enjoyed a fantastic meal, and went to bed hoping for the weather to hold. The weather held. Which meant it was blue bird and sunny as we moved over Whiteout Pass and across the Whiteout Glacier. If anyone tells you glaciers are always cold, then call them an idiot. With all the reflected light, the temperature quickly rose from the single digits during breakfast to 50 degrees by 2pm. We all stripped down to our base layers, but still ended up drenched by sweat. The terrain around the Whiteout Glacier was jaw dropping and deserved more time then we were able to give it. We ended up pushing quickly across Whiteout and down the 2,000’ feet to where it meets the Eagle Glacier. That night we camped behind a large rock on a nearby moraine. We woke up to decent skies, but a storm front moved in as we were leaving camp. 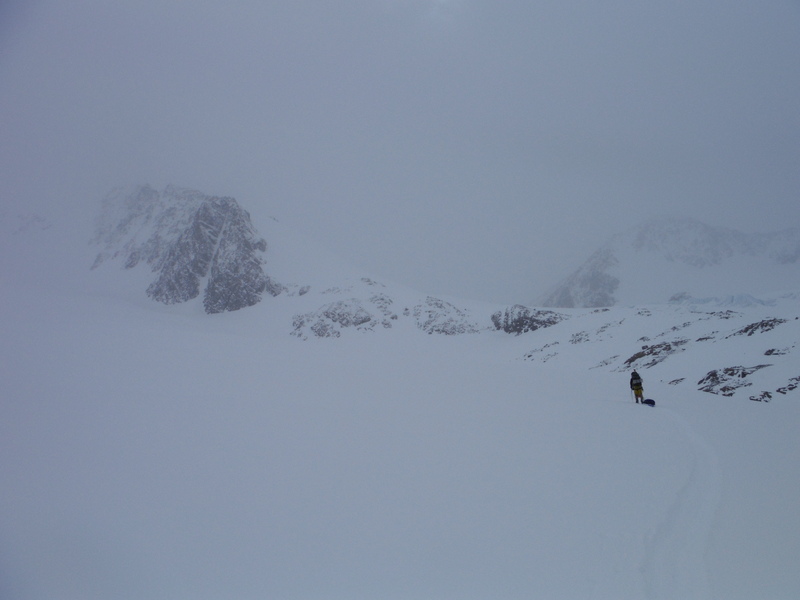 We spent the whole day navigating a whiteout as we moved across Eagle Glacier and up West Fork Glacier. We traveled up West Fork Glacier until we were half a mile from Raven Pass and set up a Denali style camp. This meant walls around all the tents, a flagged safe zone, and a pimped out cooking area. 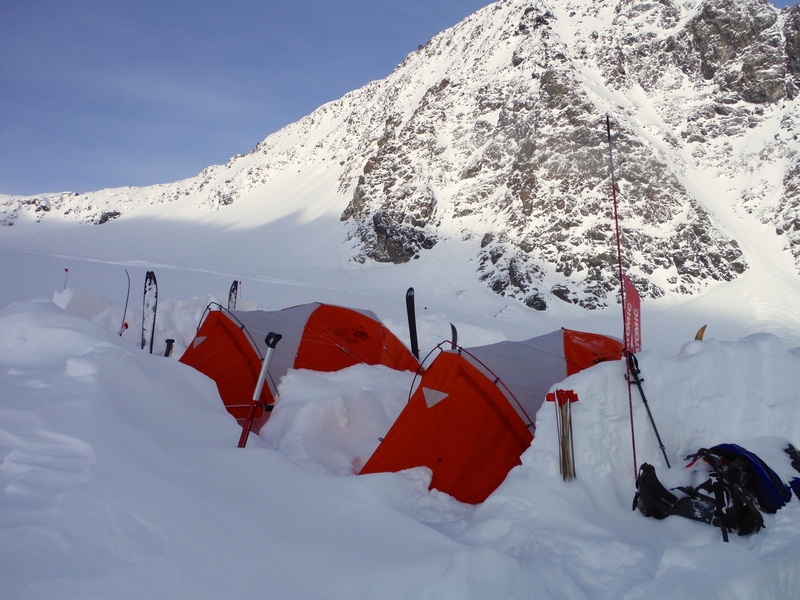 With snow piling up around our campsite, we went to bed wondering how much new snow there would be in the morning. I woke up earlier then everyone else and got out of the tent to a foot of new snow. As I got water going, the skies began to clear and I started to recognize some of the surrounding peaks. Once everyone else woke up, I let the team know that we were near the Girdwood Valley and we had only a day to go before we finished the traverse. With it only being the 6th day, I proposed that we take a day to enjoy the area. Everyone agreed, so Peter and I slammed our skis on and headed out for a day of skiing. First we headed up to Raven Pass to check out the Raven Headwall (our down route for the next day). Nervous of the new snow baking in the sun, I cautiously put a ski cut across the top of the headwall, but only got a small section to sluff. 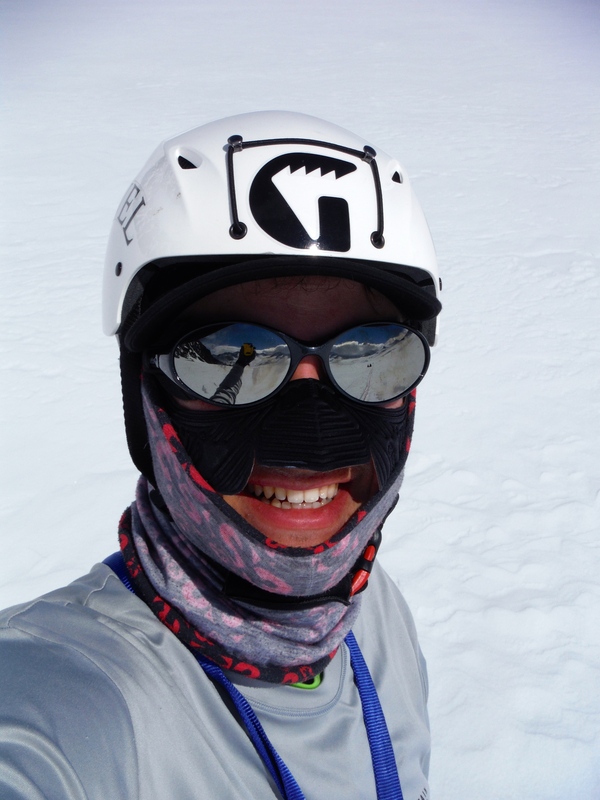 Encouraged, I dropped in and skied the 600 vertical feet to the Raven Glacier. I got about 3 turns in before my boot (which had a screw break during our double haul day) collapsed and I went from pow turns to survival skiing. In the end, Pete got the more aesthetically pleasing turns. Once at the bottom, we hoofed it back up the headwall and headed over to a north facing couloir I had been eyeballing all day. It was too steep and narrow to skin, so we tried to boot. Unfortunately, we made little progress as we sank up to our armpits in new blower snow. After about 10 minutes, we decided to head up a ramp further down the ridge, hoping to follow the ridge to the top of the couloir. Once up the ramp, I donned crampons and attempted the knife-edge ridge. Ultimately, it wasn’t possible to follow the ridge all the way to the couloir. In hindsight, it was a terrible decision. I ended up in a very exposed area with only trace amounts of snow and shale as footing, asked my partner to compromise his ski run to look for a down route for me, and wasted nearly an hour sorting out the whole situation. After resigning to down climbing back to the top of the skin track, I ended up skiing a super fun line (including a tomahawk courtesy of my broken boot collapsing again), but by then my poor decision making had tarnished my day. My problem ridge. The couloir is not pictured. 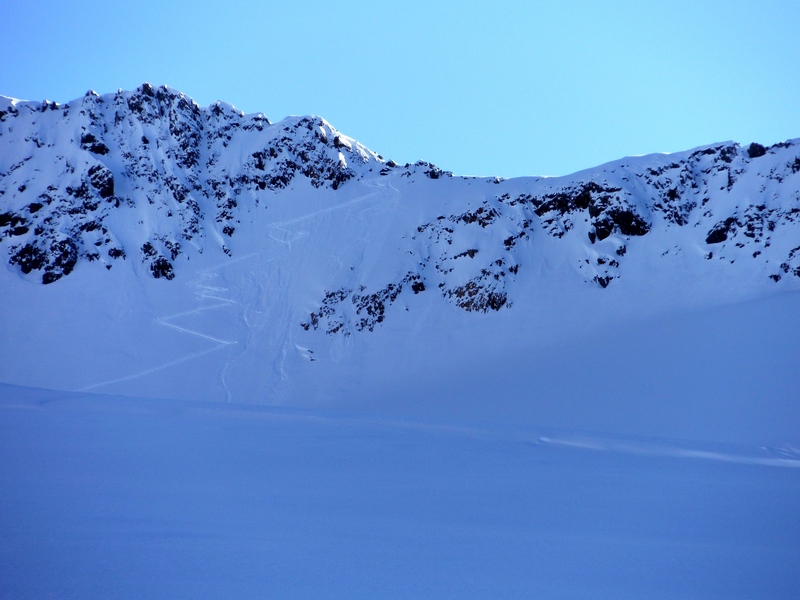 I succumbed to total tunnel vision on the couloir and let it cloud my judgment. I am thankful nothing went wrong, but I will remember that experience the rest of my life. I never want to be that irresponsible of a partner again. Once back at camp, we talked with Nick and Jake about their day and discussed our out-route for the following day. We awoke to howling winds and blowing snow. With not much of an option, we ate a quick breakfast and headed towards the Raven Headwall. With a foot of new snow the day before and high winds today, I was almost certain the headwall would be unstable. With Pete and I in radio communication, I put a ski cut across the top of the headwall, and sure enough, the first 4-5” inches slid almost instantly. 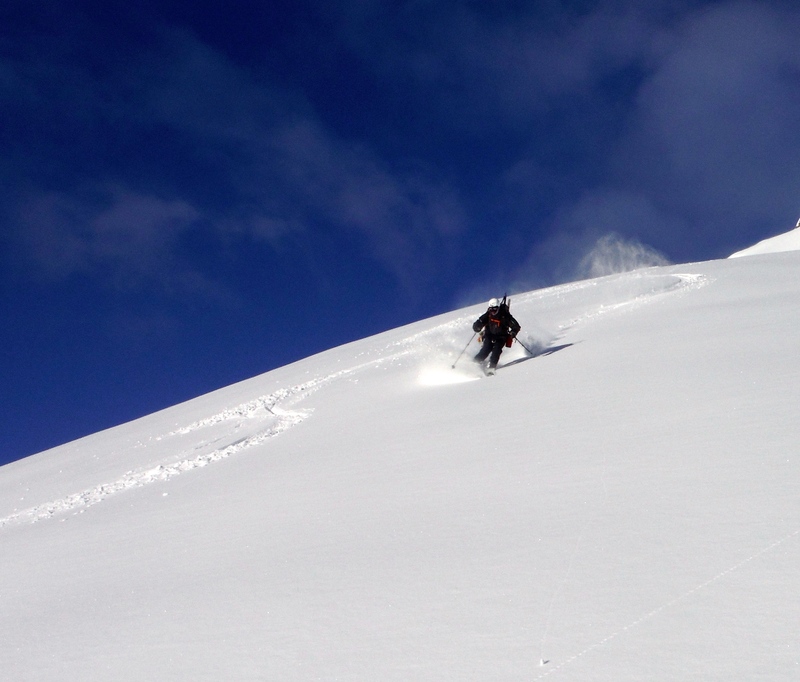 After getting most of the headwall to slide via ski cut, we skied down on the avalanche bed surface. 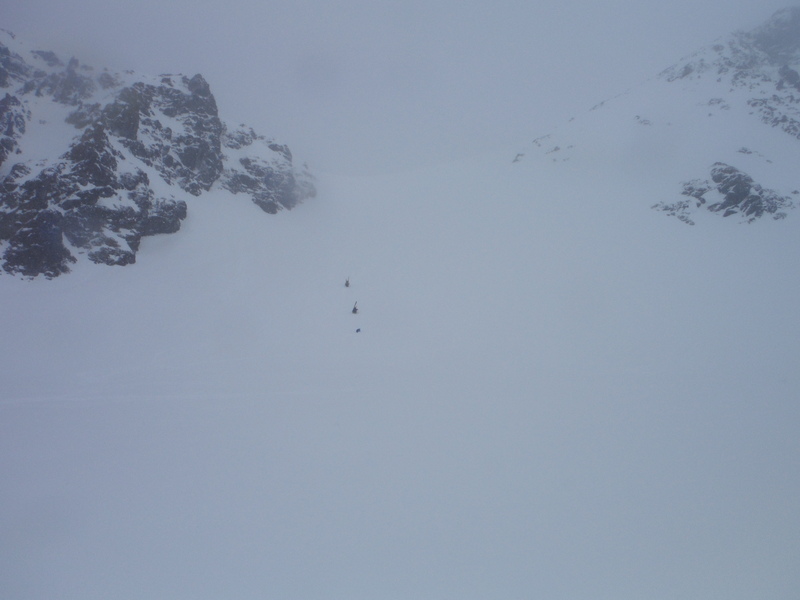 A half hour later, we had everyone down the headwall (Pete/I by skiing, Nick/Jake by down climbing) and started to move across the Raven Glacier. With winds howling and visibility shrinking to 40 feet at times, we moved off the Raven Glacier and down the Milk Glacier. Near the toe of the Milk Glacier we crossed over a small pass onto the Crow Pass Trail. We followed the trail for about an hour before we hit the trailhead and the end of our traverse. I felt great physically, understand where I need to improve my decision making, and loved our group’s communication. 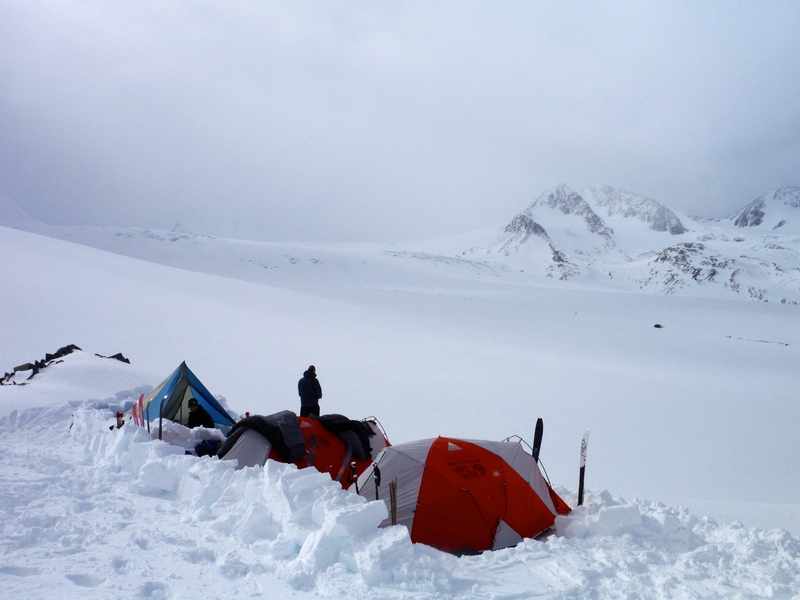 With my systems and efficiency dialed, I am looking forward to tackling Denali! I enjoyed listening to everything you guys experienced!! Very intrigued by all that you guys indured during your journey. So glad you all made it back safely, and can’t wait to hear from your next adventure! !